← Back to School? Back to Trade Shows. North America’s largest produce show, The Produce Marketing Associations “Fresh Summit” begins this Saturday, October 14. There may not be a lot of new fruits and vegetables introduced at the show but there are some exciting new solutions making an appearance at this show for the first time including pallet-level temperature monitoring. 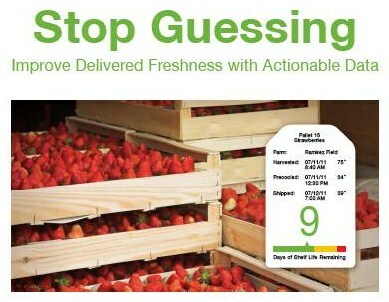 Pallet-level temperature monitoring helps growers, packers and shippers determine the actual remaining shelf life for their products in real-time. This provides the ability to route product based on each pallet’s unique shelf life. The result, actionable data that improves decision making and reduces waste – without any guesswork associated with visual inspection. If you’re at PMA, please swing by the Intelleflex booth at 3782. Along with our partner, ProWare Services, we’ll be demonstrating how Intelleflex temperature monitoring tags in conjunction with ProWare’s FreshAware software can improve cold chain operations. We’re also publishing a new case study on a recently concluded project that measured the impact of shelf-life on blackberries being shipped from Mexico into the USA. You can get a copy of the case study overview by clicking here. If you’re at PMA this weekend, please visit us at Booth 3782 or visit our partner ProWare at booth 2447 and see Intelleflex and FreshAware in action.